Turkey has brought back 80 Fetullah Terrorist Organization (FETO) members from abroad so far, President Recep Tayyip Erdogan said on Sunday. 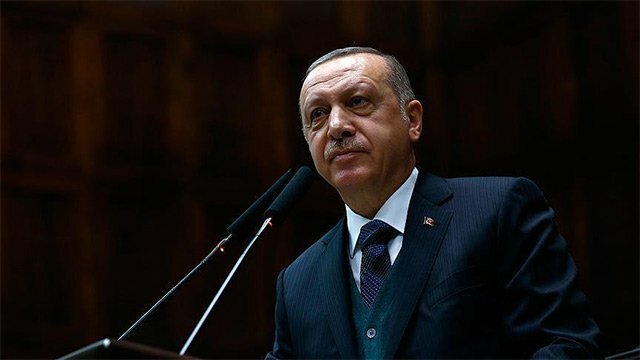 Speaking at the sixth ordinary congress of the ruling Justice and Development (AK) Party in Istanbul, Erdogan said: “We’ve brought 80 FETO [terrorists] back from abroad so far. Last week, Turkish intelligence officers brought three senior Fetullah Terrorist Organization (FETO) members to Turkey following an anti-terror operation against the group in Gabon, a Central African country, security sources said. In March, Turkish intelligence officers also brought six senior FETO members back to Turkey following operations against the terror group’s branch in the Balkans, according to security sources. FETO and its U.S.-based leader Fetullah Gulen orchestrated the defeated July 2016 defeated coup in Turkey which left 250 people martyred and nearly 2,200 injured. Erdogan also said 4,163 terrorists have been neutralized so far as part of the Operation Olive Branch in Syria’s Afrin region. On March 18, Turkish-backed troops liberated Afrin town center, which had been a major hideout for the YPG/PKK since 2012. Also, 337 PKK terrorists were neutralized in northern Iraq and 190 others inside Turkey have also been neutralized, the president added.